This is a map of the route King Chedorlaomer took once he came to the land of Canaan. He lead a large force consisting of a confederacy of four kings from the Mesopotamian area around the Persian Gulf. 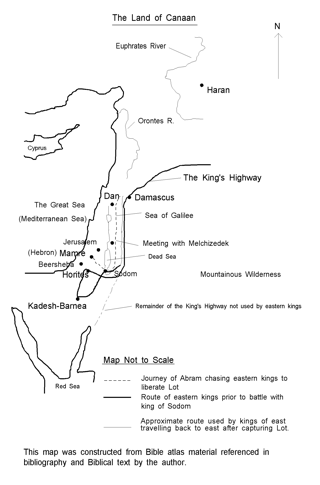 The dotted line in the map is the traverse of Abraham to Sodom and then both the eastern kings on the return journey to Mesopotamia and Abraham in pursuit up to a town called Dan where Abraham and his men overwhelmed the large forces of the Great King Chedorlaomer.